I was on my way into the office this morning at the Prudential Terry Horrocks Real Estate Agency where I am a sales agent, when I realized I was not quite awake yet. I had missed my home cup of joe this morning. I was not interested in getting out of the car and going into to one of our little convenience stores since it was twenty degrees below zero this morning. Yes -20. So, instead I stopped by my absolute favorite coffee spot, Mountain Java, on Saranac Avenue in Lake Placid at Avalanche Adventures family play spot. The cool thing about Mountain Java is that it is a drive-through coffee shop! I didn't even have to get out of the car in this bitter cold. The truth of the matter is I get my coffee there even in the summer since Krissa, the owner, sells delicious, organic French roast coffee to die for. Krissa did months of research to find the best coffee available. She approached the coffee selection like a scholarly endeavor and it certainly paid off - it is yummy. Avalanche Adventures is a neat place too. The facility features an indoor climbing wall, a Euro bungy, miniature golf and all kinds of interesting fun things to occupying kiddies of all ages. 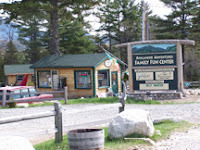 Check it out next time you are in Lake Placid, and tell Krissa Eddie's mom sent you. It is a perfect stop on your way to the mountain or x-c trails; there is nothing like a good caffeine buzz for ski accelerant.